Trailer brakes are designed as an added protection for you, your gear, and other drivers. However, you cannot operate them without a trailer brake controller. The brake controllers are installed in easy to access areas so you can use them conveniently and monitor ​any notifications and alerts as you tow. The trailer brake controllers vary in the number of brakes they can control. Choosing the best trailer brake controller may not as simple as it sounds. This buying guide will help you find the right brake controller for your towing needs. All you need is a UK ​registered car to run your own free CarVeto car check. A trailer brake controller is designed to ​activate ​a trailer’s electric brake when the driver of the towing ​vehicle ​steps on the brake pedal. The controller braking function is adjusted with the help of ​thumbwheels or levers for easy or rapid slowing down. Towing is much safer if you find the perfect trailer brake controller for your vehicle. It can effectively decrease the load on the trailer braking system. How Does ​a Brake Controller Work? ​The brake controller gets installed into the car, close to your dashboard. ​The controller includes a direct connection to the ﻿﻿﻿battery for ​its ​source of power. It has a link with the stop lights, typically from the switch at the brake pedal. This ​tells ​the machine to supply capacity to the magnet, with a direct cable from the controller. An earth is also required. A ​magnet is activated when power comes from your ​brake controller. It ​is attracted to the inside smooth face of the revolving brake hub. The rotating centre causes the magnet to revolve as shown. The magnet is mounted on a ​lever that rotates, and when it turns, it causes ​both brake shoes to pass and then apply your brakes. There are some important features that you need to consider when buying. Focusing on these features can make your purchasing experience fun, easy, and you will surely get the right product. 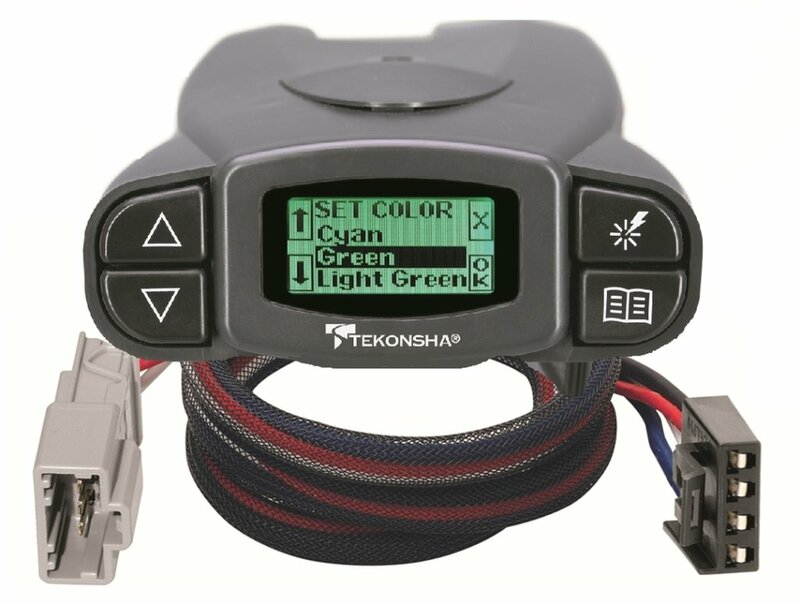 One of the important features of a trailer brake controller that you need to focus on when choosing is whether it is ​a time-delayed or a ​proportional brake controller. This type of brake controller can sense how fast a towing vehicle ​slows down and when to step on the brakes. The trailer brakes ​with the same amount of power as the tow vehicle, to ​reduce wear ​and to provide ​effective ​braking​. This type applies ​preset breaking power and ​has a delay function once the brake pedal engages. The time-delayed brake controllers can be installed in any part since they do not have sensors that determine whether a vehicle ​is going ​downhill or uphill. Aside from that, this type of brake controller is much easier to install ​compared to proportional models. This type of brake controller makes use of the hydraulic pressure mechanism on a car. The hydraulic power provides a current to control the electric brakes of the trailer. Some vehicle manufacturers give ​offer this as an OEM option, like Ford using its Ford Tow Command. ​Trailer brake controllers ​work with 1 or 2 axle trailers ​because they are the most widespread. There are some that can handle 4 axles at once and these are very efficient, with advanced functionality. But it does not mean that ​4 axle controllers are not suitable for trailers with fewer axles – they can work with any trailer with 1 to 4 axles. There are additional features that are worth mentioning in this post. These features can make ​usage simpler and more comfortable. 2. Different controls for setting the brake power for various trailers. 3. To prevent wiring failures, trailer brake controllers are equipped with short circuit protection system. 4. Plug-n-Play function for ease of connecting to a vehicle network. It lets you easily install a brake controller or remove it if you do not need it any more. 5. It has a control where you can choose electric or hydraulic braking system or you can use both at the same time. Th​us, check whether if the brake controller is suitable for a braking system of your vehicle. The brake controller connects your vehicle’s brake pedal and on the axles of the trailer. Without it, uncontrolled weight can push ahead, which can cause accidents and damage - not just to your car or truck, but to other vehicles on the road in the event that you can’t slow down or stop in time. The trailer brake controller calculates how much braking power the trailer requires when the driver presses the brake pedal on the trailer​. The magnet is activated by the power coming from the brake controller. It is attracted to the smooth surface of the revolving brake hub. The magnet revolves as the center rotates. Once it turns, both brake shoes pass ​and brakes are then applied. The trailer brake controller controls the power needed by the magnet at the wheel. The connection of the controller to the battery is the actual source of power. It has a connection with the stop light, generally from the switch at the brake pedal. This will help determine how much power is required to supply to the magnet. ​The trailer brake controllers work the same way as the emergency brake. The only difference is that it is not cable operated. It is made of a magnetic piston that attracts when the right power is supplied, thus operating the brakes. The first thing you need to do when installing a trailer brake controller is to mount it in an easy to access area. You can either position it under the dashboard and above your right leg. You can view the brake controller easily, thus it helps you monitor any potential issue. Included in the package of the trailer brake controller is a user guide which can help you on installing it. If you can follow the instructions well and you have some knowledge about what you are doing, installing a brake controller will be as easy as ABC. If you have problems installing it, you can ask a professional to help you complete the installation process. In choosing the best trailer brake controller, there are things that you need to consider. Picking the wrong brake controller could cause damage both on your vehicle and your finances. If you plan to tow fragile items or heavy-duty loads, it is best to consider buying the proportional brake controller type. One reason is that when the trailer stops, it will be smooth ​as there will be less interference on the load and on your automotive. It will keep your emergency brakes protected. If you need to tow a lighter trailer, you may consider using a time-based brake controller. This type of brake controller is usually enough for this purpose. It cost less and is recommended for lightweight loads. Proportional trailer brake controller is recommended if you will be towing more often or commercially. Time-based trailer brake controller is recommended for occasional towing. This type of brake controller is a combination of electric and hydraulic. It is recommended if you require specialized trailer brakes as this can provide the power that you need to work efficiently. The voltage should match the power source in the towing vehicle. You can choose either 12 V or 24 V. Almost all controllers require 12-volt vehicles unless specified as 24 volts. The trailer brake controller is manufactured based on the different number of axle assemblies on the towed trailer. You only need to know how much power it can provide. If the controller is ideal for 4 axles, it can be used on a single axle, double axles or triple axles trailers. LED is the display type recommended that will match any type of brake controller. It features a digital display and makes sure power is delivered efficiently. 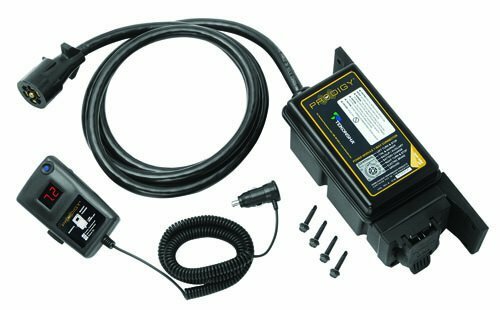 The proportional brake controller makes use of various systems to determine when your trailer is dropping off and use proportional power to the electric brakes. On the other hand, the non-proportional brake controller is time-delay activated or in a solid state. It usually applies a set amount of capacity to the braking system at a given time. You can mount it in a cradle below the dashboard or remotely with the controls protruding into the dashboard. 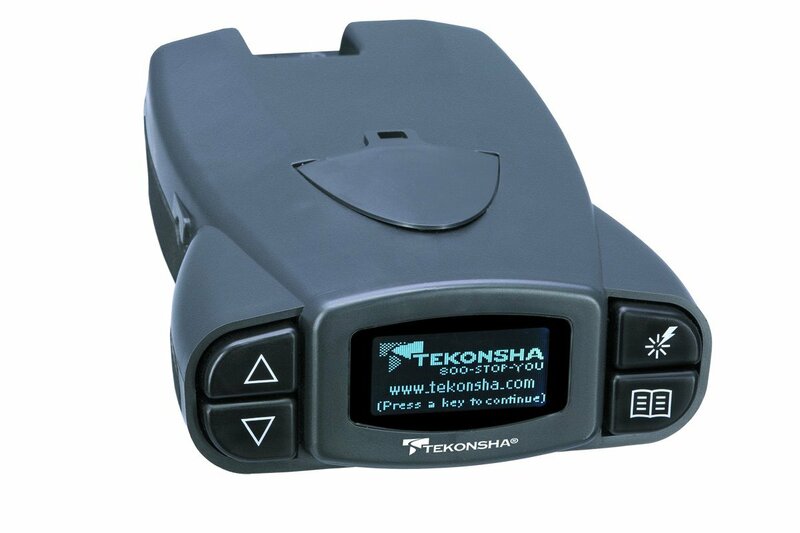 Tekonsa is the leader of the entire break controller brands in the marketplace. Smart trailer braking tends to be the key to the achievement of the Tekonsha product line. They launched their journey since 1964. The Tekonsha line has been trusted by professional towers plus weekend warriors really for worry-free travel. Top Picks for Best Trailer Brake Controller Brands! Choosing the best trailer brake controller is definitely important for your trailer. It is vital not just for your vehicle but to make sure you are safe as you drive. The trailer brake controller makes sure that the trailer can slow down or stop if needed. It is very helpful in case of emergency ​when ​you have to make a sudden stop. All ​five trailer brake controllers reviewed here come ​highly recommended ​as they possess all the important features you are ​looking for in a brake controller. These brake controllers are easy to install and you can also remove it easily which makes it an ideal companion on the road. The only factor that you can decide on is which brake controller you can afford. Keep in mind that not all expensive trailer brake controllers ​are worth buying. If you find this buying review helpful, feel free to share this post with others. You can also make a comment below for your inquiries and suggestions. You can also take a look at the compass vehicle leasing here. Missouri, like all other states, has driving while intoxicated (DWI) laws that prohibit driving while using alcohol or drugs. Missouri DWI laws include blood alcohol level limits, varying criminal penalties, suspension or revocation of driver's licenses, and an implied consent to alcohol and drug testing. Ideal break controllers are so importnat to `moden day vehicles particlarly for large vehicles like trailers automotiveandcartheory gives you an insight to car informations first hand.